Choose the correct range for your production needs. 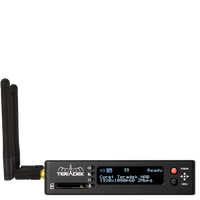 The Teradek Bolt is our line of zero-delay wireless video systems. Bolts feature unbeatable wireless performance that cuts through the toughest of interference, including RF congestion, walls and weather conditions, allowing you to always monitor the shot. The Bolt 500 achieves a range of up to 500 ft. line of sight, and is perfect for short-range, studio productions with little interference. The Bolt 1000 & 3000 achieve 1000 & 3000 ft. line of sight, and are ideal for long-range applications such as live sports, car-to-car and productions with multiple walls. Bolt 10K offers the highest range available, which is perfect for UAVs, industrial communications, and ultra long-range video needs.